Fundraising Personalized Car Window School Team Sport Decals Magnets Yard Signs. 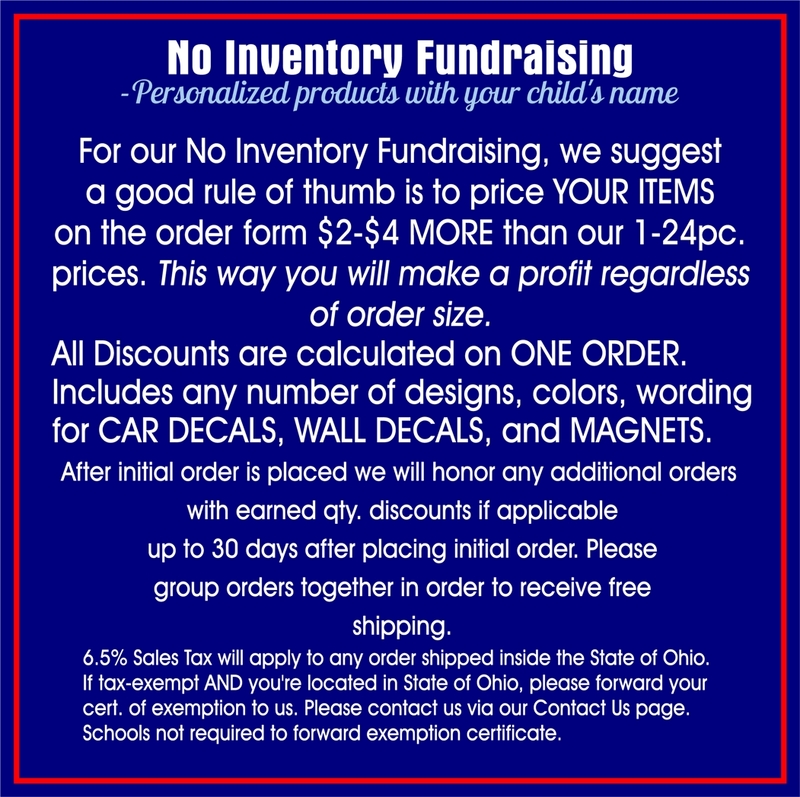 No Inventory Fundraising is simply TAKING ORDERS for personalized decals & magnets. **EASY OPTION: EMAIL your order forms! These are our products with individual player names and jersey #'s. and place ONE order with us for HUGE discounts! Choose one or many designs-no limit. All products included on One order! Re-order within 30 days and receive the SAME QTY. DISCOUNTS as orig. order! Scroll to bottom of page for helpful tips on how to do our easy fundraising decals and fundraising magnets! *Feel free to download any of the forms below to hand out for orders. As our download form explains, you can copy any selected design, print and attach to an order form. which include Design #, Team Name, 2 Team Colors. Note: All Order Forms below can be scanned and emailed for even quicker selling! Scan and email to everyone on your list for orders! Share on Social Media. Note: We are located in the State of Ohio. If your ship to address is outside the State of Ohio, sales tax WILL NOT apply. If your ship to address is inside the State of Ohio and you are not Tax-Exempt, 6.25% sales tax will apply after any qualifying discounts if applicable. Contact us for set up of a tax-exempt acct. if you are tax-exempt. (We will be happy to send you a proof of your chosen design for you to put with downloaded order form, sign up sheet or on an order form you do not see listed. (Specify Your Two Team Colors, Team Name and Design # From any of our Sport Categories) In subject line of email put "Design for Order Form". Thank you! Please email us at Stephanie@allsportdesigns.com. Please allow 1-3 business days or sooner. Please note: Please contact us for custom work. In many instances we offer your logo at our website prices. See our Custom Decals and Magnets category for more info. Thank you! If having any difficulty downloading any forms, an updated adobe reader may be needed to be installed on your computer. You can get a Free Adobe Reader at www.adobe.com. Note: YARD SIGNS NEW PRICE: $25.00 EA.MIN. 5. FREE Sign Stakes & FREE Shipping. You may right-click on any image (designs in categories) to copy and paste to print out and put with one of our down-loaded team order forms. (Fastest). Please remember to obey copywrite laws and DO NOT use for any other use other than putting designs on order form! Thank you. (We will be happy to send you a proof of your chosen design for you to put on downloaded order form also (Specify 2 team colors, team name and Design # ('s) along with sizes you will be offering.Our website does not have "preview" software compatible as of yet. In subject line put "Design for Order Form".) This is a free service we provide. Please email us at Stephanie@allsportdesigns.com Please allow 2-4 business days or sooner. ...Want QUICK SELL One Team or School Name Decals & Magnets? Click on quantity & products desired to order with your design choice, colors, wording, etc. Remember, you can choose ANY DESIGN on our website-Not just what is pictured here!! Proof of your chosen design will be emailed to you before your order is printed. Don't see a size or quantity or size you're looking for? We'd be glad to give you a quote. See "Contact Us" at top of page. Fundraising Car Locker Laptop Tablet Decals Stickers Car Locker Refrigerator MagnetsWall Decals TShirts Apparel Yard Signs.